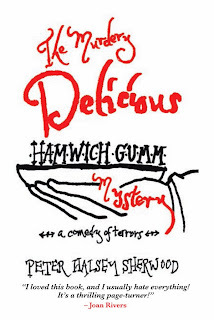 The Murdery Delicious Hamwich Gumm Mystery - Blood Curdling Duck Breast! As my fiendish murder mystery hits the shelves, I present a sneak peak of the dastardly recipes fraught, rigidly fraught! with clues to be found in the pages of The Murdery Delicious Hamwich Gumm Mystery. Go to amazon.com or bn.com to order your copies, just in time for the holidays! Such a wicked gift! While we anticipate the foul murders in my novel, please peruse the series of recipes and cocktails in the upcoming weeks, here on eveningswithpeter...presented...in hideous parts. See what the Grosvenor girls cooked up for their fiancees as demonstrated below! Halve most of the figs and simmer in an appropriate pan with wine, broth, and cinnamon until thick, about 30 hand-wringing minutes. Strain and throw out the solids. Light a fire in the oven to reach 450 degrees. Sear the shallots in four tablespoons of butter. Proceed to toss about the mushrooms and ginger until all is unspeakably calm. Pour in the rest of the liquid and simmer down for a few minutes before tossing in the chives. Cloak remaining figs in honey about a glass baking dish and cook until they have surrendered. This should take less than 15 minutes. Litter the duck breasts with salt and pepper before abandoning them skin side down in a heavy skillet laced with melted butter and olive oil, placed over medium heat. Turn and turn until boredom sets in and breasts are still nearly bloody. Serve with a portent of the mushrooms, figs, and a wicked whim of warmed sauce. As my fiendish murder mystery is about to hit the shelves, I present a sneak peak of the dastardly recipes fraught, rigidly fraught! 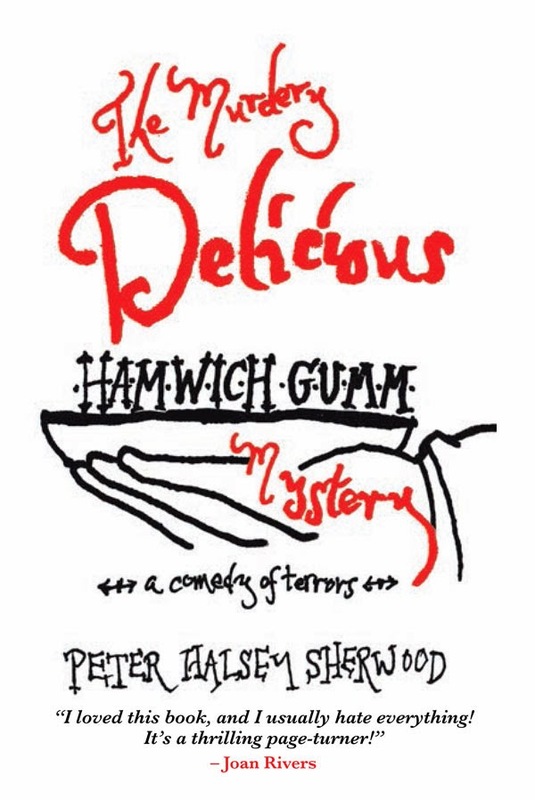 with clues to be found in the pages of The Murdery Delicious Hamwich Gumm Mystery. While we anticipate the foul murders in my novel, please peruse the series of recipes and cocktails in the upcoming weeks, here on eveningswithpeter...presented...in hideous parts. Purloin fresh lavender and stick it in a bottle of vodka. Let it sit in darkness for about two weeks to make the extract. Put sprigs of rosemary and perhaps some thyme in a bottle of Stoli honey flavored vodka. Let that sit for about two weeks as well. Rinse chilled Champagne glasses with the lavender extract. In an ice-filled shaker, use about 2 oz per serving of the rosemary/thyme steeped honey vodka. Add perhaps the barest breath of rose water if so inclined. A squeeze of lemon is welcome. Shake and pour into your glasses. Top off with fizzy, almost freezing Champagne. Do note that this cocktail must be served vitally cold--and garnish with fresh, fragrant thyme sprigs. Then throw it on the floor. As my fiendish murder mystery is about to hit the shelves, I present a sneak peak of the dastardly recipes fraught, rigidly fraught! with clues to be found in the pages of The Murdery Delicious Hamwich Gumm Mystery. My Nana used this basic recipe for pie pastry and somehow it wound up in my book. Think of it would you when turning toward the holiday season--pork pies! Pumpkin pies! Pecan pies! While we anticipate the foul murders in my novel, please peruse the series of menus in the upcoming weeks, here on eveningswithpeter...presented...in hideous parts. Sift flour and salt into a bowl. Cut in shortening with a destructive device such as a blender or two very sharp knives until crumbly. Add ice water, stir cautiously with a fork and add more water just until it holds together. Make into a ball and knead with prudence. Beware: Handle as little as possible. As my fiendish murder mystery is about to hit the shelves, I present a sneak peek of the dastardly recipes fraught, rigidly fraught! with clues to be found in the pages of The Murdery Delicious Hamwich Gumm Mystery. While we anticipate the foul murders, please peruse the series of menus in the upcoming weeks, here on eveningswithpeter...presented...in hideous parts. Rinse spinach bundle and then drop in a wee dram of boiling salted water until wilted, one to two minutes. Drain and plunge into cold water. Strangle the bundle of spinach to release the water, then vehemently chop into bits. Slay the onions in the butter until softened, about four minutes. Bring the milk and cream to a conspiratorial simmer in a separate pan. Kill heat. Put aside. Take the flour to task, whisking into the onion and butter mix to make a roux with the consequence of milk and cream slowly stirred in afterward to settle for about three minutes, continually whisking with fervor to avoid lumps, and simmer until thickened, three to four minutes more. Add a slash of nutmeg, the mutilated spinach, and resolve with thyme leaves removed from their stems, and a dash of salt and pepper. Bring to a heated conclusion. Launch applauding bouquets of roses all about the room for any occasion--or none at all? Modern advice on etiquette for the not-so-new-millennium. The legendary New York Palace is still going strong, with Villard Michel Richard to bolster it! SHORT ORDER: An exquisite experience helmed by master chef Michel Richard, and extraordinarily designed by the divine Jeffrey Beers. PETER’S PANS: We didn’t experience an ectoplasmic visitation from the long-departed Leona Helmsley. Also, I’ve run out of superlatives. 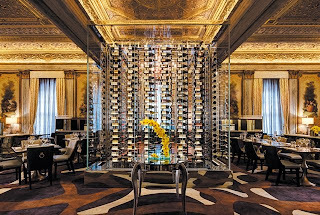 Having recently visited the extraordinary Villard Michel Richard helmed by the gentleman himself, master chef Michel Richard, in the legendary New York Palace hotel, I can confidently assert that even former proprietress Leona Helmsley would be proud. Interior designer Jeffrey Beers has created an exquisite, remarkably ornate experience that must be seen to be believed—seriously, there’s enough gorgeous grandeur and intricate pomp that, were circumstances somewhat different, Marie Antoinette herself would lose her head. 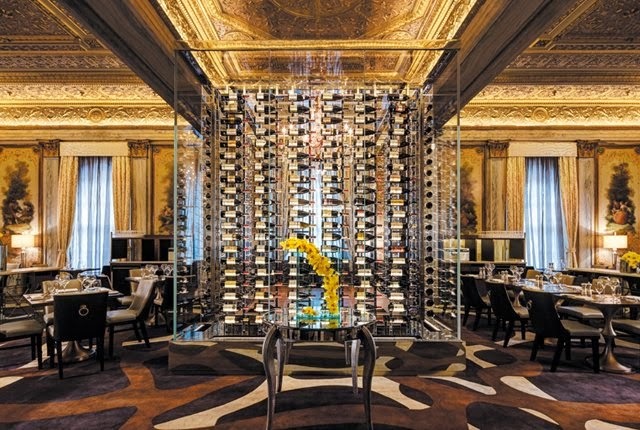 Illumined golden curls blaze upward on the sconces that flank the marble finishes and original paintings lining the walls and all the while, an outrageous temperature-controlled chamber known as the “wine cube” is stocked with 1,000 bottles and anchors the sprawling dining room. Cocktails crafted from age-old recipes border on the mystical and are taken quite seriously at Villard Michel Richard. The few rounds my friends and I encountered while we lingered were devastatingly good, but certainly not for the uninitiated, and should be sipped slowly. Alongside a basket of petite gougères (fancy French cheese puffs), an evenly balanced sidecar rattled forth, straight up in an elegantly etched coupe that lent a feminine touch to the otherwise masculine tables. My Negroni was on the rocks, however, in a brew of G’Vine gin, Campari, sweet vermouth and a conspiring orange zest. Cubes of tuna tartare tangoed with watermelon; at once a wonderful chewy crunch left to dance on the palate with a suggestion of sesame oil. We shared spoonfuls of superb, steaming sherried French onion soup with luscious violin strings of cheese, and also leaned toward rich, sumptuous lobster bisque poured over chopped lobster meat and onions that all came to full flavor as the bowl rested near to room temperature. The sole crab cake was bedded by finely shredded leeks bathing in a bright drizzle of chive oil. Mushroom feuilleté delighted—we devoured the luxuriously plump shiitake mushrooms neatly sandwiched between layers of puff pastry. Mushroom risotto outfitted with pearls of pasta and topped with a crumbled Parmesan tuille was a delicious interim course that we also shared, before launching into mains. Seared salmon was served fairly rare with just enough salt. Tender, tiny lentils, carrots, and shallots accompanied. A gargantuan slab of medium rare côte de boeuf au poivre was prime perfection. Served with French fries and a side of haricots verts tossed with crispy shallots, it readily warranted the $59 price tag (and is the most expensive item on the menu). Michel’s fried chicken was beyond. Start taking notes: the breast and legs are first wrapped with chicken mousse and shaken with bits of country bread before being fried. The end result: tender, mouth-watering pieces of chicken resting upon absolutely dreamy mashed potatoes. We easily succumbed to the banana split topped with cubes of pineapple and served with plots of vanilla and chocolate ice cream as well as strawberry sorbet with sugar-browned Rice Crispies. The Napoleon featured more puff pastry, lighter than air, filled with a ridiculously delicious cream. First published in part in Next magazine.